Phillip Sipiora is Professor of English and Film Studies at the University of South Florida. 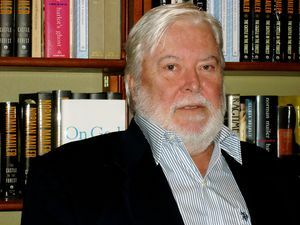 He is the author or editor of five books and has published approximately three dozen scholarly essays. He has lectured nationally and internationally on twentieth-century literature and film and is the Founding Editor of The Mailer Review. He is the editor of a forthcoming volume, Ida Lupino Behind the Camera. Sipiora, Phillip, ed. (2013). Mind of An Outlaw: Selected Essays. New York: Random House. — (2013). "Norman Mailer, Discursive Artist". The Mailer Review. 7 (1): 190–202. — (2009). "The Complications of Norman Mailer: A Conversation with J. Michael Lennon". The Mailer Review. 3 (1): 23–65. — (2009). "Perspectives on Cinema: A Conversation with Tom Luddy". The Mailer Review. 3 (1): 565–569. — (2016). "Nietzsche's Fingerprints on The Hands of Orlac". In Brill, Olaf; Rhodes, Gary D. Expressionism In The Cinema. University of Edinburgh Press. pp. 235–247. — (2011). "Phenomenological Masking: Complications of Identity in Double Indemnity". In McNalley, Karen. Billy Wilder, Movie-Maker: Critical Essays On the Films. Jefferson, NC: McFarland Press. pp. 102–116. — (2007). "Living in a Darker World: Hemingway's Figural, Phenomenal Florida Fiction". Florida English. 5: 42–62. This page was last edited on 13 February 2019, at 08:12.